Maruti Suzuki has given the Alto K10 hatchback as boost in safety to meet Bharat New Vehicle Safety Assessment Program (BNVSAP) norms. Along with additional safety features, prices of the car has increased to Rs. 3.66 lakhs for the base LX model, ex-showroom Delhi. This represents a price hike of Rs. 10,000. All variants of the Maruti Alto K10 now get a driver-side airbag, ABS, a speed alert system, seat-belt reminders for driver and co-driver and rear parking sensors as standard. Apart from the addition of safety features, nothing else has changed on the Maruti Alto K10 – both in terms of mechanicals and styling. The Alto K10 is available with a 1 liter-3 cylinder naturally aspirated petrol engine that puts out 67 Bhp-90 Nm. Fuel efficiency is rated at 24.07 Kmpl. The same engine is also available with a petrol-CNG dual fuel option. In this trim, the motor makes 58 Bhp-78 Nm while running on CNG. A 5 speed manual gearbox is standard on both the petrol and CNG variants of the car. The petrol version also gets a 5 speed AMT option. The Alto K10 rivals the likes of the Renault Kwid 1.0, the Hyundai Santro and the Tata Tiago. The car is one of the least priced offerings from India’s largest car maker – Maruti Suzuki – and is aimed primarily at first time car buyers. 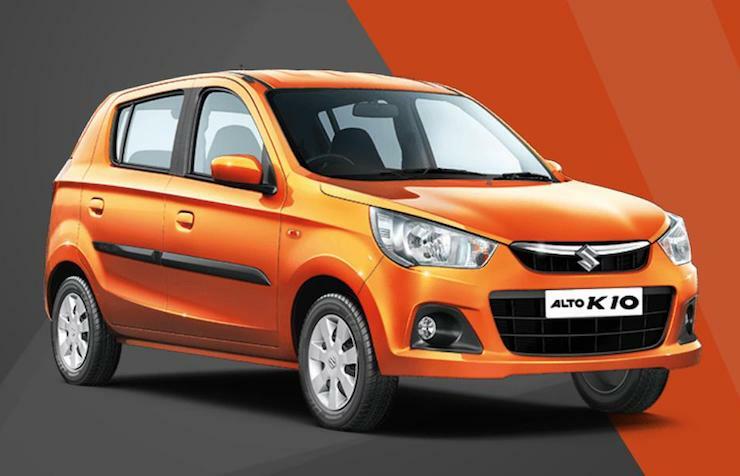 Maruti adding safety features to the Alto K10 is to ensure that the car is able to be sold until the October of 2019, when more stringent safety norms related to the structure of the car come into force. The Maruti Alto range is about to get all-new models in the coming months. Maruti Suzuki has been testing the next-generation Alto on Indian roads for the past many months. Before October 1st, 2019, the date on which the more stringent safety norms come into force, the all-new Alto range will make its debut in India. Notably, both the Alto 800 and Alto 1.0 will get major upgrades through this generation change. The 3rd generation Alto models will get a totally different design. Said to be inspired by the Future S crossover concept that was shown at the 2018 Indian Auto Expo, the new Alto range will get butch styling. Additional ground clearance and more spacious interiors are other changes likely on the new car. The engines will be made Bharat Stage 6 emission norms compliant, and both CNG and petrol options are expected to be on offer, as is the case presently. The new Alto’s platform is also expected to support electric and hybrid options.